Santa Clara Valley Water District CEO Beau Goldie award contract to firm with inside connections to the water district. There are no questions about the severity of California’s drought. Its impact is evident everywhere: brown grass, serious water restrictions and parched reservoirs. But board members and insiders at a South Bay water district question recent decisions made by its CEO to take emergency action and seek approval of a project designed to increase Silicon Valley’s dwindling water supply. "If it was a normal year we would move down a normal path to address this," said Beau Goldie, CEO of Santa Clara Valley Water District. "But we are not in a normal year. We don’t know how long this drought is going to last." Earlier this year, Goldie expedited a $10 million single source contract without a competitive bidding process, which would have allowed other qualified companies to propose work on the project. The project is intended as a drought solution, but won’t pay water dividends for at least five years. Keegan voted against the proposal. She, along with board chair Gary Kremen, voiced concern about the single source nature of the contract at an April 28 board meeting. 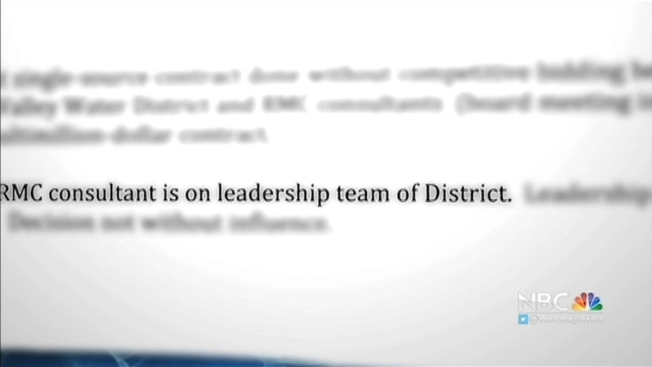 Yet it was not until after the April board meeting that board members became aware of an inside connection between the district and one of the contract winners, RMC Water and Environment. One of its principal owners is married to an executive staff member at the district who is currently the sixth-highest paid employee in a district with approximately 1,000 staffers. Public economic interest disclosure forms, show Melanie Richardson, the Deputy Operations Officer for the Watershed Design and Construction Division, has held between $100,000 and $1 million in RMC stock. The forms also show her husband, Tom Richardson, is a principal, paid more than $100,000 a year by RMC. Both Kremen and Keegan question why Goldie did not disclose that relationship prior to the board’s vote. Goldie does not see the relationship as a conflict of interest. He says the district has a “firewall” in place to insulate Richardson from decisions involving RMC, which has received $18 million in contracts with the district since 2004. Goldie also denies that he executed a favor for one of his high-ranking deputies. The president of RMC addressed the relationship in a statement provided to NBC Bay Area. “We have always understood that appropriate policies and practices are in place at the district to assure that the highest standards of professional integrity are adhered to in its contracting process, including preventing potential conflicts-of-interest. With regard to the contract in question, the District staff, legal department, and board of directors recommended selection of RMC with full knowledge of RMC’s project manager’s marriage to a District employee,” the statement read. In a separate emailed statement, Melanie Richardson wrote that she is “not part of any communications that pertain to services being performed now or in the future by RMC.” She continued, “I recognized the potential for conflicts of interest years ago and have done everything I can to avoid true or even perceived conflicts. I truthfully acknowledge my financial relationships in my annual Statement of Economic Interests (Form 700), a public document. I have been extremely diligent in staying clear of any communications or decisions related to the company where my husband works." Ultimately, the multimillion-dollar drought solution passed with a 5 to 2 vote. Goldie said he wouldn’t change anything about how he sought board approval. But board chair Gary Kremen has called on the CEO to suspend negotiations with RMC until the conclusion of an external investigation. “I am going to call on my fellow board members to stop this,” Kremen said. Goldie said it will take a new vote by the board to halt the current single source contract. Some board members who voted for the drought relief proposal recently told the Investigative Unit they would not change their vote. Others said they join Kremen’s call for an outside investigation.